Washington: A team of Japanese scientists has found a species of bacteria that eats the type of plastic found in most disposable water bottles. 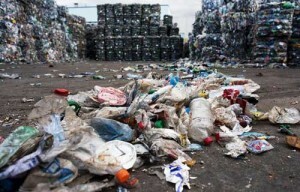 The discovery, published on Thursday in the journal Science, could lead to new methods to manage the more than 50 million tonnes of this particular type of plastic produced globally each year. The plastic found in water bottles is known as polyethylene terephalate, or PET. It is also found in polyester clothing, frozen-dinner trays and blister packaging. “If you walk down the aisle in Walmart you’re seeing a lot of PET,” said Tracy Mincer, who studies plastics in the ocean at the Woods Hole Oceanographic Institution in Massachusetts. Next, they screened the microbes living on the samples to see whether any of them were eating the PET and using it to grow. They originally found a consortium of bugs that appeared to break down a PET film, but they eventually discovered that just one of bacteria species was responsible for the PET degradation. They named it Ideonella sakaiensis. Mincer, who was not involved in the work, said the study was impressive and did a good job showing that these organisms were eating the plastic pretty well. However, he said it was not immediately clear whether or not it would help keep plastics out of the ocean, for example. He added that the research could make it easier to identify other microbes that might have similar PET-degrading capabilities.